A team of University of Wisconsin–Madison students won an innovation award in a worldwide SpaceX Hyperloop pod competition. The UW–Madison Badgerloop team competed against 30 teams from colleges and universities from around the world in the second phase of SpaceX’s Hyperloop pod competition, which was held Jan. 27-29, 2017, outside SpaceX headquarters in Hawthorne, California. Teams spent the week leading up to the competition on site at SpaceX, where they put their pods through a litany of tests in hopes of getting the chance to run their pods on SpaceX’s one-mile Hyperloop test track. The brainchild of SpaceX and Tesla Motors co-founder Elon Musk, the Hyperloop is a futuristic high-speed transportation system. The idea is for passengers to travel in levitating vehicles – “Hyperloop pods” – through an above-ground vacuum tube, enabling super-fast travel between distant cities. 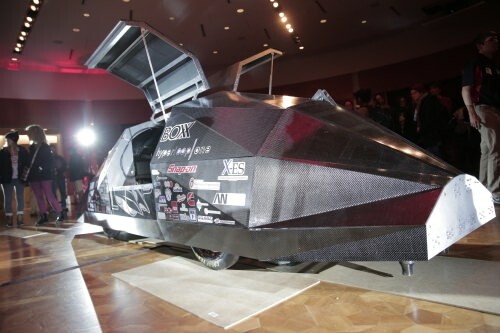 After more than a year of intensive design work and construction, the Badgerloop team brought its 15-foot-long, 2,100-pound pod to California for the competition. 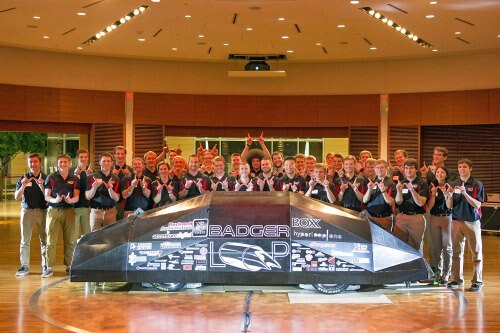 While some bugs in the pod’s mechanical and electrical systems ultimately prevented Badgerloop from making a run on the test track, Badgerloop operations director Claire Holesovsky said the experience of building the pod as a team and participating in the competition has been very rewarding. In the end, only three of the 30 teams in the competition were able to actually launch their pods on the test track, which highlights the extreme difficulty of the technical and engineering challenges the student teams faced as they attempted to design and build pods for an entirely new mode of transportation. When they announced the results of the competition, the SpaceX judges emphasized how difficult it was to build a levitating Hyperloop pod that doesn’t crash, adding that they weren’t sure if any of the teams would be able clear all the technical hurdles that would allow them to safely run their pod on the track. Delft University of Technology from the Netherlands was the overall winner with the highest score in the competition, and the Technical University of Munich won the award for fastest speed achieved in the Hyperloop tube. Badgerloop received one of two innovation awards in the competition. The judges noted the team’s innovative designs, including the virtual reality setup that Badgerloop created. Badgerloop leaders said it’s an honor to win the innovation award, especially since the team is led by undergraduates. 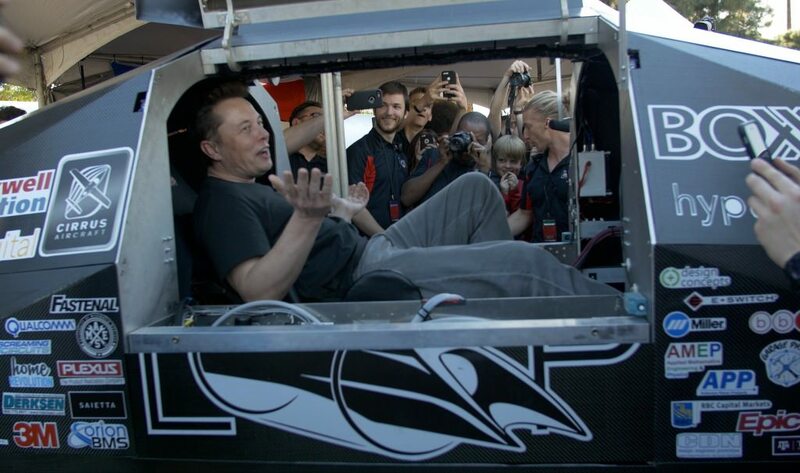 The team purposefully built its pod to fit Musk, who is 6 feet 2 inches tall. Badgerloop got its wish when, after delivering remarks at the competition, Musk toured the various teams’ booths and took the opportunity to sit in the Badgerloop pod. Badgerloop, which won third place in the initial round of SpaceX’s Hyperloop pod competition, will continue to work on and refine its pod. The team already has plans to compete in the next installment of the competition, which is set to take place in summer 2017 at SpaceX’s Hyperloop test track. “Badgerloop is definitely going to continue, and I can’t wait to see what we can accomplish,” Holesovsky says.